If I can’t get outside, then I like to do a little yoga and pilates inside. I also find it to be a great way to stay in shape during the colder months when I’m not doing activities outside as much. While you can buy all sorts of yoga gear, the most essential piece is the mat. And if you buy a good one the first time, then you won’t need to get another one. When choosing a yoga mat, there are a lot of different options out there. If you prefer to keep your life free of toxins, then choosing an eco-friendly yoga mat is probably the best option for your needs. The biggest benefit of this type of mat is that you can get one that is free of petrochemicals. This is especially important for people who are concerned about the health implications of such substances. If you see a mat labeled as “eco-friendly,” then this probably means that is is free of PVC, or polyvinyl chloride, which is a type of plastic. PVC is something that can contain phthalates, lead and cadmium, which are things that have been linked to hormone disruption in some studies. Note that just being labeled eco-friendly does not mean that the mat is made from biodegradable or sustainable materials. 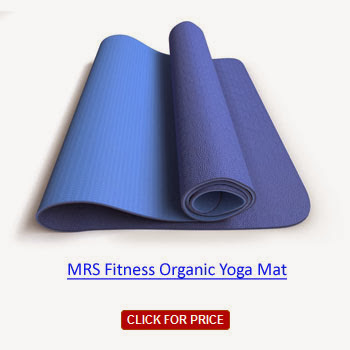 The prices for each of the environmentally friendly yoga mat types is about the same, so you can really just use personal preference to determine which is your preferred mat material. Natural rubber yoga mats are made from the rubber tree, which makes this a good renewable energy choice. Plus, it is a biodegradable material. Unfortunately, not everyone can use a mat made of this material, which is also known as natural rubber latex. That’s right – if you have a latex allergy, this will trigger it. However, you can find synthetic, latex-free mats to overcome this issue. Alternative plastic mats are made of synthetic plastics will be either “PER,” or polymer environmental resin, or “TPE,” thermoplastic elastomers. Each is supposed to be made without any type of toxic substance. Of the two, only TPE is biodegradable as PER is made with PVC. So, I would advise against any PER alternative mats. Plant fiber mats can be made of hemp, jute and cotton. Since these are plants, this means that you have both a biodegradable and renewable source. One important thing to note, however, is that a lot of cotton is genetically modified, or GMO, so for the most environmentally friendly option that is made of cotton, look for non-GMO cotton. You can easily find certified organic plant fiber yoga mats, which I highly suggest for the least amount of toxins in your mat. Mats that are made of plants that are not organic will have some pesticide residue. If you prefer the thin yoga mats over the thicker ones, then this one is a great choice. This is made of natural tree rubber, but latex allergy sufferers should note that it is non-allergenic and 99.9% latex-free. What I really like about this mat is that it has a wet-grip surface, which perfect for better slip resistance. If you do hot yoga or practice yoga at home on a hardwood floor, then this mat will ensure that you’re not sliding while trying to hold a pose. Being made of natural rubber, it does have a little bit of a plastic scent when it is new. However, it fades away quite fast and you don’t have to worry about that small being toxic since there are no harmful chemicals in this mat. The surface area is very easy to keep clean if you just wipe it down with a soft cloth and an organic soap or cleaner. Note: you can order this exact mat in a longer and thicker version – click here. I like that this mat is both thicker and longer than most yoga mats. 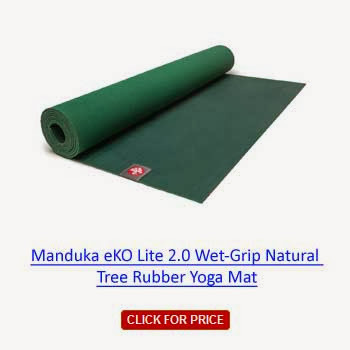 It is double the thickness of the Manduka eKO Lite 2.0 above. However, this mat is not a good choice for everyone. While the mat is supposed to be slip-resistant, it is only mildly so. If you’re doing hot yoga, then you may wanna skip this mat. The surface is textured though, so you’ll be okay using this mat if you’re not focusing on hot yoga. The mat is made from thermoplastic elastomer, which makes it a good choice for latex-allergy sufferers. You can order it in one of three colors: blue, pink, or purple. And, like the mat above, this one is also easy to keep clean. An interesting feature of this yoga mat is that it has a lifetime guarantee. So if it ever rips or anything, you can get it replaced for free – no questions asked. 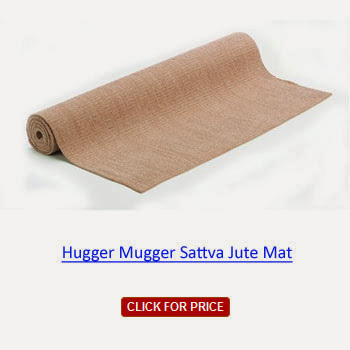 If you want a mat that is made out of plant fiber, then this Hugger Mugger eco-friendly yoga mat is one of the best ones out there. This is a great type of mat for doing hot yoga. With this mat, you get a little extra added comfort as it is a little thicker than your standard yoga mat. Plus, this mat is super durable as jute is a very strong material. The only thing that I do not like about this mat is that there is a non-slip PER coating on the back side of it. Without that coating, the mat would slide too easily, so it is necessary. A cool feature to note about this mat is that the jute is resistant to mildew. Yoga is an art of training the body and mind to focus on what is going on at the moment. The philosophy of yoga centers on the union between human beings and a union with a greater energy that connects all the human beings. The benefits of yoga depend on the type of yoga you practice. Many forms of yoga practices are safe to perform. However, some of the yoga practices are strenuous and may not be safe for everyone. For the beginners, Hatha yoga is the best type of yoga for you. Yoga has both physical and spiritual benefits. Women can benefit from yoga as it can increase their fertility. Yoga deals with all the aspects of health whether mental or physical. Therefore if you want to lead a healthy life, why not try yoga? Most of the yoga practices emphasize on balancing your body by developing both flexibility and strength. Yoga helps you to understand your body better making you appreciate the importance of taking good care of it. Therefore, it will be easier to tackle most activities as you have a strong and flexible body. Yoga boosts cardiovascular activity and lowers the risk of high blood pressure and diabetes. Those people suffering from high blood sugar levels or high blood pressure will benefit from yoga if they perform it on a regular basis. Increased blood circulation relieves muscle pain and makes your body fresh and energized. When you turn your body upside down, you will be increasing blood flow to your brain. This will stimulate the blood vessels to your brain. The world is full of stressful situations. Stress may lead to depression and other conditions like stroke. An intense yoga session will leave you feeling euphoric and very happy. Incorporating tactile sensation and soft movements will help you feel relaxed. Yoga poses include twisting, back bending, strengthening balancing and inverting. All of these activities involve the back meaning that the muscles supporting the spine will stretch and also become stronger. Therefore, all those people experiencing back pain should try simple yoga poses. Yoga postures work on all the muscles. This will help loosen and lengthen your muscles to reverse muscle tightness. Muscle tightness may be caused by activities like running. This is one of the reasons why it is wise to warm up before performing sporting activities.